Collect and set up your equipment first. A piece of muslin or cheesecloth perfectly clean and soaked a few minutes in boiling water to sterilise. Add the yoghurt to a mixing bowl. Stir in the rosemary, garlic and salt until combined. Add the Tamarind Lime and Chilli Spice Itt mix and combine well once again. Now sit the colander in the bowl and lay the muslin cloth inside the colander. 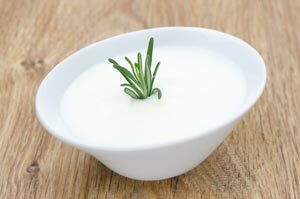 Pour the spiced yoghurt into the middle of the muslin and pull the edges of the muslin up to cover the yoghurt. Tie with a piece of kitchen string at the top. Leave in the fridge 24-48 hours. The whey will drain out into the bowl*.